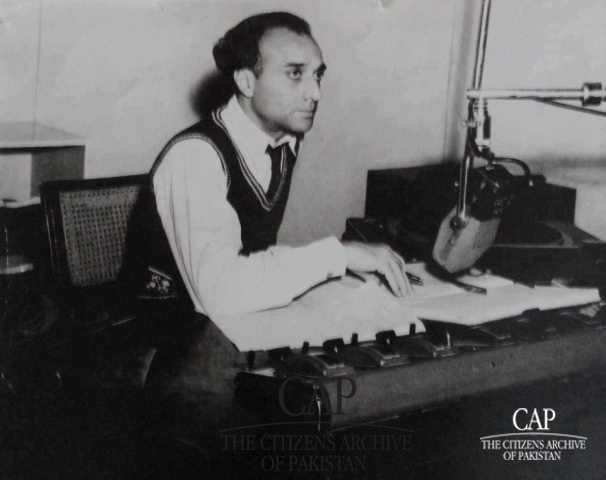 [Karachi:13thAugust2013]:The Citizens Archive of Pakistan [CAP], a non-profit organization dedicated to cultural and historic preservation, has released exclusive images from their Oral History Project (OHP) as a celebration of Pakistan’s Independence Day. 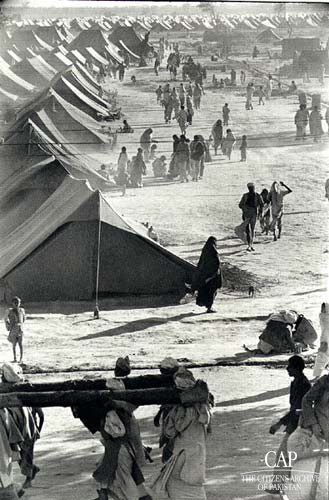 These photographs feature historical figures and moments from Pakistan’s history such as broadcaster, Mr. Mustafa Ali, announcing the creation of Pakistan on the radio, a congregation of the Delhi Muslim Student Federation and the state of refugees who left all their belongings in India when they migrated to Pakistan. The Oral History Project lies at the heart of CAP. The stories emerging from the Project, the secrets behind old photographs and the personal experiences of our nation’s rich and varied people feeds the material used in the Outreach Tours, the Shanaakht Festival and several other exhibitions. The OHP concentrates on people talking about significant events in their lives during the early days of Pakistan, providing an alternative perspective to historical literature. The OHP works with different communities in Pakistan under sub-projects such as the Minority Project and Lollywood Through The Ages. The project also aims to archive and preserve various records such as letters, newspapers, refugee cards, official correspondences and passports. CAP serves as the first ever private Pakistani initiative to collect, archive, study, disseminate and exhibit all aspects of Pakistan's history after partition, their vision is to become the foremost museum and heritage centre of Pakistani history and culture, demonstrating the strength and spirit of Pakistan from the perspective of a citizen. The Citizens Archive of Pakistan [CAP], a non-profit organization dedicated to cultural and historic preservation, operating in Karachi, Lahore and Islamabad. CAP seeks to educate the community, foster an awareness of our nation’s history and instil pride in Pakistani Citizens about their heritage.CAP has focused its attention on the tradition of oral storytelling in Pakistan, emphasizing the importance of such narratives in a dialogue on national identity. The organization has three main goals: to preserve and provide access to the archive, to build and support educational programs, and to develop educational products based on the testimonies collected.CAP is passionate about sharing Pakistan’s stories with the educational Outreach Programs and the thousands of visitors who attend their festivals, exhibitions striving to share knowledge in original and exciting ways. after the heartening success of the SOT program, CAP is now reaching out to over 4500 first and second year college students in Lahore and Karachi. The College Outreach Tours utilizes material from CAP’s archive to develop workshops. These workshops are based on civic sense, tolerance, democracy, constitutional rights, and invoke critical thinking as well as an understanding of the country's history and heritage. The program is bilingual and includes research-based interactive activities designed to inculcate a broader vision of Pakistan. Exchange for Change is another exciting initiative by CAP that aims at improving relationships between school students in different countries. This program seeks to help students across borders realize that dialogue is not just possible but sustainable too. Through cross-culture communication students can have a clearer understanding of their history, culture and lifestyles. CAP believes that such interaction will in turn lead to a positive change and eliminate cultural misconceptions and inter-generational conflict. A sustained exchange of letters, postcards, pictures, artwork and videos encourages children to form their own opinions. Currently this project is running in India and USA. At its very core CAP strives to build bridges and close gaps while trying to enhance the very perception of Pakistan by use of film, the spoken word and photography. Their vision is to develop CAP as the foremost museum and heritage center of Pakistani history, photography, culture, literature and historical documentation demonstrating the strength and spirit of Pakistan from the perspective of a citizen. Each exhibit tells important stories about the country and provides an engaging and thought-provoking window into the nation's past, present and future.